January 25th, 2016. Early this morning Bandai's online virtual pet evolved to the Baby II stage, having well exceeded the 3500 care milestone needed for evolution. This unlocked the next tier of rewards for Digimon World -next 0rder- and Linkz, an additional Chain Melon and two Digistones. The Digimon was put up online on the 21st as a Digitama, and hatched into Botamon within 24 hours of going up. Fans around the world are caring for the Digimon using the page's "care" command, which creates a premade tweet for them to share on Twitter. Currently the counter is at 7314; at 8000 Koromon will evolve to his Child stage. 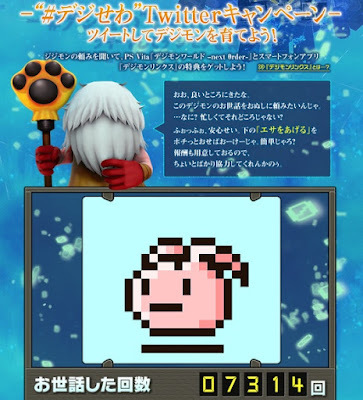 The next tier of rewards is one more Chain Melon and three more Digistones, items which are used to respectively extend a Digimon's lifespan in -next 0rder- and replenish its stamina in Linkz.